Saturday September 15th 1900 Leonard took a day of and Will and I went to town for the day. I helped Mother put up some peaches for Ott and had a good visit. The letters today say Lee is not so well. Weather cooler. Sunday September 16th 1900 I read some and got early dinner. We spent the afternoon up at Stevens. It was cool enough to make a fire comfortable today. I wrote to Fannie in the evening. Monday September 17th 1900 Will went to Hills to see about a car I had churning on hand and got dinner early for us to go to Coralville. We found the wind mill damaged by the storms or neglect of the tenant. I got a lot of peaches on my way home and worked till late to take care of them. Tuesday September 18th 1900 I put up peaches till noon and swept the house all over in the afternoon. The boys began to haul corn to Hills but was stopped by a shower. 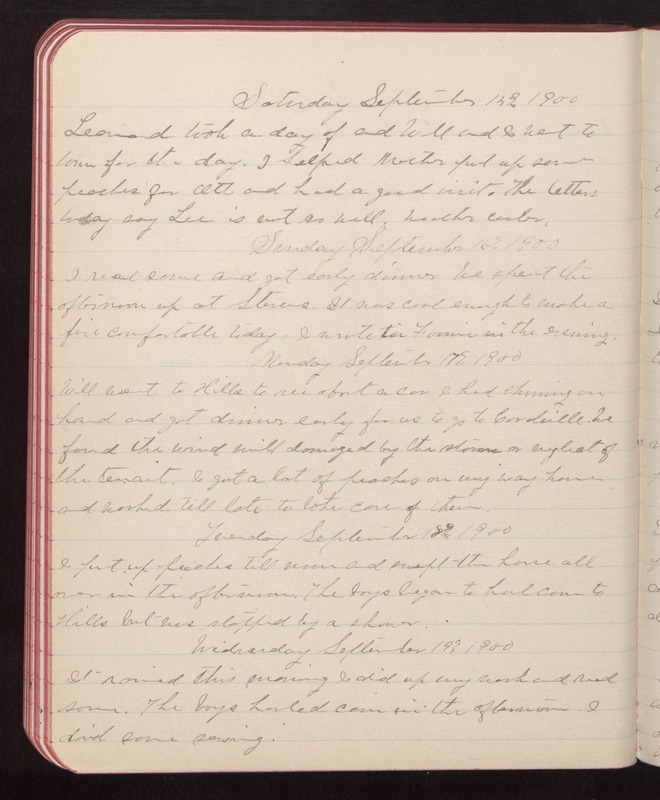 Wednesday September 19th 1900 It rained this morning I did up my work and read some. The boys hauled corn in the afternoon. I did some sewing.